In honor of the 50th anniversary of Hawaii Statehood in 2009, we prepared this list of the 50 things that you might not know about Hawaii. See how many of these 50 things you might now know about Hawaii. Hawaii is the most isolated populated group of islands on earth - 2,390 miles from California and 3,850 miles from Japan. Hawaii was the last significant pieces of land on earth to be found and documented by Western explorers. Hawaii is the only state that grows coffee. It is grown on five of the major islands. The Hawaiian Archipelago consists of 132 islands and atolls stretching over 1,500 miles in length. Hawaii has no billboards, rabies, snakes, or seagulls. Hawaii has its own time zone. It does not observe daylight savings time. The southernmost point of the United States is located in Hawaii - South Point on the Big Island of Hawaii. About 200 of the 680 types of fish in Hawaiian waters can be found nowhere else in the world. By a legislative act, Hawaii became officially known as the "Aloha State" in 1959. The Hawaiian alphabet consists of only twelve letters. The five vowels are A, E, I, O, U. The seven consonants are H, K, L, M, N, P, W.
There are no racial or ethnic majorities in Hawaii. About 30% of Hawaii's residents are Caucasian. Asians make up about 40%. Native Hawaiians and other Pacific Islanders make up about 9% of the population. The coral reefs in the Northwestern Hawaiian Islands make up about 70 percent of all the reefs in the USA. Despite what you saw on Hawaii Five-0, there is no state police force in Hawaii. Each county has its own local police force. The Maui police also cover Molokai and Lanai which are part of Maui County. Hawaii is the largest consumer of Spam in the United States. Hawaii is one of only two states that has interstate highways without actually bordering on another state. Hawaii was originally called the Sandwich Isles. Captain James C. Cook so named the islands in 1778 in honor of his patron the Earl of Sandwich. The state fish of Hawaii is the humuhumunukunukuapua'a also known as the reef triggerfish. The Hawaiian Flag is the only state flag to display the "Union Jack" of the United Kingdom representing Hawaii's historical relationship with Great Britain. The ukulele, considered to be pure Hawaii, was actually brought to the islands by the Portuguese. Ukulele means "jumping flea," and was so named because the fast-moving strumming of the hand while playing looked like a dog scratching. The instrument is properly pronounced oo-koo-ley-ley. The paniolo, or Hawaiian cowboys, learned to herd cattle from Spanish vaqueros who were imported to teach them. The Hawaiian word paniolo was derived from "Español." Having no defense against the diseases brought by foreigners, the native population of Hawaii dropped from around 300,000 in 1779 to about 40,000 in 1890. Hawaiian shirts are a product of the 19th century and began when missionaries gave the Hawaiians plain shirts to cover their bare chests. The Hawaiians painted the shirts to make them more attractive. Hawaii's Big Island is the largest of the Hawaiian Islands with a land mass of 4,028 square miles - twice the combined size of the other islands. Kilauea volcano is the world's most active. Hawaii's Big Island grows by over 42 acres per year. The Big Island is home to what was once the largest privately owned ranch in the United States - Parker Ranch with over 480,000 acres. Mauna Kea is the tallest mountain in the world if measured from its base on the ocean floor to its summit. During the winter it can snow on Mauna Kea. Hawaii Volcanoes National Park is the only World Heritage Site in the state of Hawaii. In Kealakekua Bay, there is a 5,682-square-foot area that was deeded to England for a monument to Captain James Cook. The island of Kauai is home to one of the wettest spots on Earth. The average yearly rainfall on Mt. Waialeale is about 426 inches. Kauai is the oldest of the main Hawaiian Islands - over six million years old. By law, no building on Kauai is allowed to be built taller than a palm tree. Polihale Beach, on Kauai's western side, is Hawaii's longest beach. It's 17 miles long and 300 yards wide. Imported from Wyoming, buffaloes roam the Hanalei River Valley on Kauai. The Wailua River is the only navigable river in Hawaii. The island of Lana'i was once the home of the world's largest pineapple plantations, producing 75 percent of the world's pineapple. Today there is no pineapple grown on the island which now depends on tourism to the two large resorts. There's only one town on the island of Lana'i, Lana'i City, in the heart of the island. Haleakala, the world's largest dormant volcano, is 10,023 feet high and has a crater big enough to hold Manhattan Island. The Road to Hana on Maui's north shore is a 55-mile long, narrow road and features 617 curves and 26 one-lane bridges. Founded in 1831, the Lahainaluna High School in Lahaina was the first American school established west of the Rocky Mountains. Charles Lindbergh, the famed aviator, is buried in the churchyard of the Kipahulu Hawaiian Church, a couple of miles beyond Oheo Gulch. 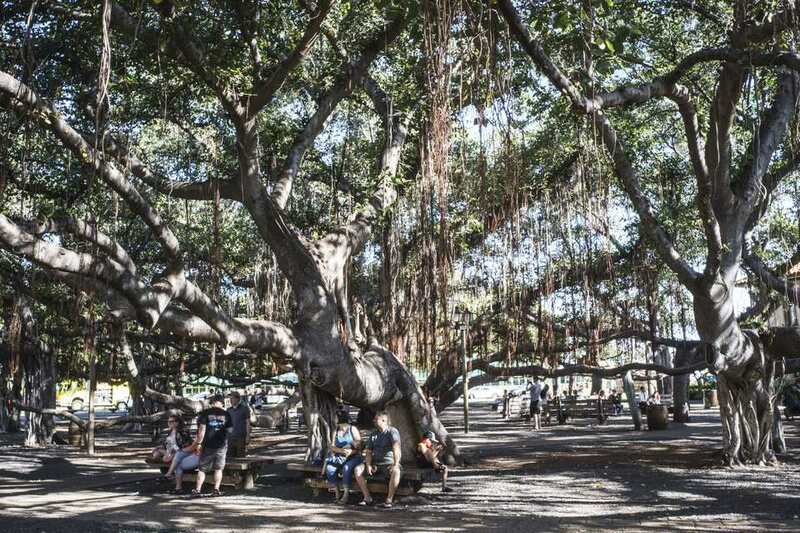 The Banyan Tree in Lahaina was planted in 1873. It's now more than 50 feet tall, has 12 major trunks and shades two-thirds of an acre. It's so big that special events are held under it. The sea cliffs of Molokai are the tallest in the world, rising 2,000 - 3,000 feet above the waves. There are no traffic lights or shopping malls on Molokai. The Kalaupapa Peninsula on Molokai was once a leper colony. It was here that those suffering from Hansen's Disease were exiled. Today less than a dozen patients still reside on the peninsula which is overseen by the National Park Service. Diamond Head crater (called Leahi by the Hawaiians) was so named for the sparkling calcite crystals found there, which British sailors at first thought to be diamonds. The largest permanent Army Post in the United States, Schofield Barracks, is located on Oahu. The 'Iolani Palace in Honolulu is the only royal palace in the USA. It was built in 1882 under the reign of King Kalakaua. It had electricity four years ahead of the White House in Washington, D.C. Some of the fabled white sands of Waikiki Beach were actually imported from Molokai, 40 miles across the waters. Other sand came from as far away as Manhattan Beach, CA. Thank you to the Hawaii Visitors and Convention Bureau for a portion of the content used in this feature.